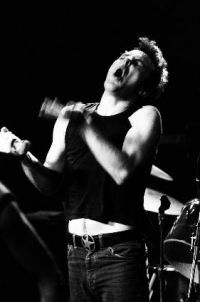 Jello Biafra. Photo by Catherine Andersen. On a drive home from a recent family reunion, my daughter and I popped in the Dead Kennedys’ (1980) Fresh Fruit for Rotting Vegetables. It’s an album that for me marks an awakening social consciousness in junior high. My big brother Chuck used to play Dead Kennedys albums in his basement and my gal pals and I would listen in the next room, sometimes sneaking in and rifling through his record collection. Because of this, I spent the majority of my life identifying the Dead Kennedys and punk rock with liberal beliefs. Punk rock has never really been my number one favorite music genre, and yet, I’ve always held the implied values dear—individuality, dissent, and freedom of dynamic expression, just to name a few. If the hippies were the counter-culture of the 60s, then punk rockers were the counter-culture of that counter-culture. Although the values above are congruent with those of the previous generation, I think the difference is in the freedom of emotional expression. Somehow, punk rock amped up the volume on anger, and I can understand why. When I went back to school to get a graduate degree, I even considered writing my master’s thesis on the psychology of punk rock. My motivation was driven by the angry emotional quality of the music, not just lyrically, but via the very tonality. Dylan Thomas’s “do not go quietly into that good night/rage against the dying of the light” often came to mind when reflecting upon what I’d heard. Charging power chords and dissonant harmonies, not to mention East Bay Ray’s eerie banshee moan of the guitar drew me in and woke me up. His opening solo on “Holiday in Cambodia” was like a death rattle, yet oddly hard to turn away from. Being rattled felt good. Couple that with a healthy dose of Jello Biafra’s snarky “Eddie Haskell with a conscience” voice, and you couldn’t sleep through this stuff if you tried. Their music was anything but sedating. It wasn’t designed to be sedating. Rather, their message was a much needed slap in the face for those of us still alive but in denial and shock over the current state of affairs. “Holiday in Cambodia” pointed out the privilege of even those of us who want to sympathize with exploited minority groups. Indeed, no amount of education can foster the empathy and understanding that our complaining middle class claims to have. We have no idea how fortunate we are. But consumerism won’t have that. Even those of us who are overfed need to be convinced that we’re starving, or we’d stop gorging ourselves to death. Please pass the gravy. I’ve listened more as an adult to the actual lyrics of the songs, and my respect for the music has grown exponentially. I’ve found some threads in the lyrics of this music that paint a stoic picture of why punk rock music is such a necessity to our world, no less following a cultural zeitgeist of peace and love that had its own shadow side: a shadow that I believe still shows up today. Don’t feel bad. Only feel good. To contextualize, I will offer some of my own personal and clinical experience with the emotion anger. I’m a native of the Bay area, hippie capitol of the world. We almost have just as many therapists here as we do hippies. Now, I don’t tend to like to stereotype people, but I do believe that certain movements characterize a social climate: its progress and setbacks. I love hippies. I love love-fests. I love freedom of expression. What I don’t love is being told that freedom of expression excludes anger, sadness, and fear. And although I know that not all people who proudly identify themselves with hippie values feel this way, I’ve encountered a good portion of people who seem to want to shut down any uncomfortable emotion, especially fear and anger. Rather, transcendence is pushed down our throats like a jagged little pill, and it’s not even a pill that’s good for us. Honestly, do we really believe that we can “vibrate our problems away?” It’s almost as bad as telling a woman who has cellulite that rubbing the special cream on her rear end will make it disappear. It’s just another form of sedation and false promises, often cloaked in the long flowing robes of a charismatic spiritual teacher who we don’t question, much like the vulnerable followers of Jim Jones. I’m a therapist. We have our own social personae to live down. Generally speaking, therapists are expected to not have conflicts. Therapists are placid and cool. We don’t sweat, and we never get high blood pressure. We are characterized as the pinnacle of stoicism, and although we are often mocked for accidentally revealing our less than perfect lives (yes, therapists have lives and get pissed off, scared, and sad sometimes), we are also often turned into therapists even when we’re not trying. It can make relationships hard when the expectation inevitably fails. With that said, I’ve felt frustrated with the image tacked on to the choice of my life profession, especially since I would never in a million years encourage my clients to try and live up to the same expectation. My job is not to foster perfection. My job is to help my clients become healthy, and sometimes health includes dropping into our most animal, flesh, and blood selves. The transcendence does not come with avoidance and repression. The transcendence comes with acceptance, compassion, and paradoxically, descent. If I had a dime for every time somebody told me that anger will make me sick, turn me into an eternally bitter wretch, or kill me, I’d have my retirement covered. If I had a penny for every time I heard it from another therapist, meditation teacher, or spiritual personality, I’d also have a lifetime supply of ice cream. However, I would assert that it is unresolved anger that kills us, unexpressed, and repressed. Violence towards others won’t solve it and may lead to shame, but in a strange way, repressed anger can be a violence towards self. In order to resolve anger, we have to experience it and channel it into efficacy. With that said, I am grateful that I can still somehow match each one of those people who frowned upon anger so quickly with somebody who understands the importance of anger and the necessity to effectively and respectfully express it. Bless those people. Just like the Dead Kennedys, they help me keep my finger on the pulse of sanity. Just like many of my clients, I need occasional reminders that not only is it OK for me to feel and express anger, but a necessity for my own health. Many of my clients come to me with so much guilt for every emotion they feel. The first place they often go to is self-judgment. “Why do I feel so angry, what’s wrong with me, how do I make it go away?” Almost always, these clients also initially tell me that they want to stop being so overly accommodating, so passive, so afraid of people who seem to lack no conscience regarding their own needs and emotions. There’s a level of enmeshment that sometimes occurs—a lack of identification with the very emotions that serve as critical guideposts on the road to personality development and clear value systems. And essentially, anger often is coupled with a personal boundary violation. It can alert us and shift us into a focused discernment. Anger is not necessarily violent. Sometimes, it is cogent and aware. It serves to remind us of who we are via knowing where we begin and end, and where other people begin and end. It is often the guardian standing at our contact boundary, and boundaries are important. Yes, sometimes fluid, but hopefully the discernment that comes with anger lets us know when we don’t have to be a philosopher and can actually just be a real human being who needs to draw the line. After all, boundaries may be a concept, but how we determine where they are drawn is quite concrete. Our emotions can give us a sense of what we need. Many of my clients struggle with anger because in their lives, past and present, anger was almost always coupled with some form of emotional or physical violence. In these cases, anger failed to keep boundaries, and somehow lines were crossed, threatening to harm either the physical or psychological entity of self. I realize that another common hippie counter-culture principle is to question the concept of “self.” It makes for fascinating philosophical conjecture, and yet, when faced with split second decision making and the emotional health of a client, philosophical conjecture only proves at times to feed the very self-doubt and shame that keeps passive people from finding solid ground to stand on, namely the ground of “self.” It can also keep people at a stalemate, uncertain about what actions they need to take for their own benefit or even the benefit of those they care for. I often have to educate my clients about anger, help them differentiate anger from violence, and also help them understand that in a healthy system, if there is no space for expressing anger, there is poor differentiation between people and unnecessary martyrdom. I also have to remind people that being different and having conflict can strengthen rather than destroy relationships. I think of Murray Bowen’s undifferentiated ego mass in which, as Bateson pointed out, one person itches and the other person scratches, and yet nobody really knows what is going on. The consciousness in enmeshment is minimal. The dynamic range is limited to a tune somewhat similar to “Mary Had a Little Lamb” sung by a class of kindergarteners on Ritalin. So, how do the Dead Kennedys relate to this? Well, their lyrics didn’t just reflect anger about power, privilege, mass murder, and greed. In fact, these guys took no prisoners, writing punk rock masterpieces that are far from bipartisan in their social critique. With the acuity of a vet locating the disembodied head of a tick on a black cat, the Dead Kennedys also called out what I coin as “new age fundamentalism.” The sarcastic tone in lines like “your emotions make you a monster,” and “your kids will meditate in school” are harsh reminders of the setbacks of the often times overly cerebral hippie counterculture movement. Songs like “Drug Me” spell out the trend of numbing, pinpointing the many forms of emotional insulation we succumb to that are built in by the architects of Western Culture. I might add that those architects are not just corporate America (pharmaceuticals, YouTube, the Gap), but also groovy cocktails, marijuana now included and deemed as “medicinal.” Red wine can be medicinal, too. Guess what? We’ve got just as many marijuana addicts as we do alcoholics. Add “a-motivational syndrome” as a symptom, and we’ve got a lot of people who may have some fascinatingly expansive conversation and no will to act or change. I believe that marijuana should be legalized, and I believe that some people can manage it recreationally. I don’t believe, however, that it’s harmless. Like most medicines, it has its negative side effects and can be addictive. I also want to add that although some mind-altering drugs have shown to expand consciousness, drugs can also narrow consciousness. If we’re using a substance to avoid our “monstrous feelings” and the “inconvenience” of other people’s annoying feelings (e.g., conflict), we’re not expanding our consciousness. We’re narrowing it. Just like the neglect of an overly indulgent parent, no conflict and constant peace can actually inhibit the growth of a healthy ego. And that’s exactly where big brother wants us. I’ve stopped using confirmation bias with the argument on medical marijuana. It has its advantages and its harmful effects. Truncated brain development in adolescents doesn’t encourage growth towards free thinking, but rather conforming to non-conformity without question. It can be just another form of fitting in at the expense of the self-awareness that results from befriending our emotions and emotional tolerance. Honestly, how is smoking pot to take the edge off any different from taking Prozac? And I do believe that Americans abuse Prozac. Finally, I would add that anger is not hatred, and can even be expressed as an act of love. Not expressing anger can even block intimacy. There is a popular therapeutic cliché about anger that I often challenge. The cliché is that anger is a secondary emotion to fear (another bastardized emotion that per my opinion serves a purpose within context). I believe that people can be afraid of expressing anger. I also believe that it takes great risk for some people to express anger. Expressing anger can be an act of vulnerability. My bet is that there is not one person in this world who hasn’t had the experience of being shamed, rejected, or abandoned for expressing their anger, and I actually mean expressing anger appropriately. However, there are times when expressing anger is exactly the eye opener that somebody else needs. I will also say that as a clinician, I have witnessed, time and time again, my clients getting angry about another person or at me. It is one of the most beneficial things that can happen, and every time I’ve received anger with acceptance from a client, the result has been a deeper, more connected bond. I’ve had clients tell me that one of the most important aspects of change in our therapy was their ability to express their anger to me. Anger is one of the most relevant emotions to growth and change. Anger, if seen as alarm bells rather than the five-alarm fire, can alert us to larger problems. Larger systems and people with exploitive power understand this and don’t want us to get angry. With that said, I would really think twice about new age fundamentalism and its implicit motives to keep us “calm.” Are we unknowingly buying into another scam? Is this just a more “cool” way to keep people under control? I think it’s a question worth asking. Bateson, G. (2005). Essays for an ecology of ideas. Exeter, UK: Imprint Academics. Bowen, M. (1993). Family therapy in clinical practice. Lanham, MD: Jason Aronson Publishers. Dead Kennedys (1980). California uber alles. On Fresh Fruit For Rotting Vegetables [CD]. San Francisco, CA: Mobius Music. Dead Kennedys (1980). Drug me. On Fresh Fruit For Rotting Vegetables [CD]. San Francisco, CA; Mobius Music. Dead Kennedys (1980). Holiday in Cambodia. On Fresh Fruit For Rotting Vegetables [CD]. San Francisco, CA; Mobius Music. Dead Kennedys (1981). We’ve got a bigger problem now. On In God We Trust, Inc. [CD]. San Francisco, CA; Mobius Music. Thomas, D. (1952). In country sleep and other poems. Vashon, WA: Vashon Island Books.